Need a new way to dress up your spaghetti noodles? This delicious chicken dinner is easy enough for weeknights and has vibrant flavors and beautiful splashes of color! 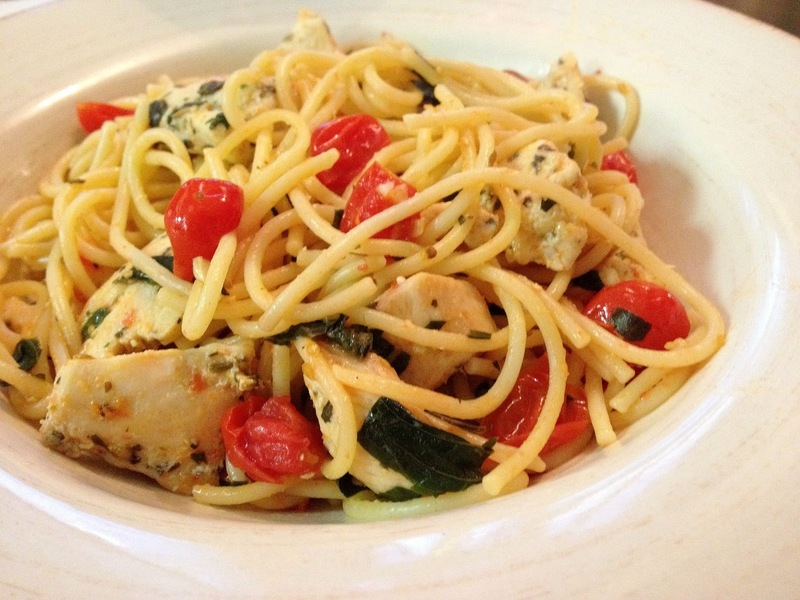 Simple ingredients like tomatoes, chicken, basil and garlic make this a healthy, fresh choice (pssst...it's also under 400 calories!). Meanwhile, season chicken generously with salt, pepper, oregano & dried basil. Heat a large skillet on med-high heat. Add 1-2 tsp olive oil. Add chicken. Saute 3-4 min. or until no longer pink. Remove and set aside. When water begins to boil, add pasta and cook according to package directions. Reserve about 1/2 cup cooking water before draining. While pasta cooks, add remaining olive oil to skillet on med-high heat. Add garlic and saute until golden brown (do not burn!). Add tomatoes and salt & pepper to taste and reduce heat to med-low. Saute 4-5 min. When pasta is drained, add it to the tomatoes and toss well. If pasta seems to dry, add some of the reserved pasta water. Add fresh basil and chicken and toss well. Serve topped with grated cheese if desired.